Did you know that a diamond engagement ring can have shoulders? And a cathedral? What?? Yes, you’ll find more than meets the eye with these stunning pieces of jewelry. So, let’s see what a ring has to offer! We’ll give you a behind the scenes look at the essential anatomy you will want to know. As a smart shopper, you’ll be able to articulate exactly what you want when planning that big proposal or anniversary gift, or you’ll feel more confident about a ring that you already own. Imagine you are looking a ring that is sitting on a flat surface. Do you see the center diamond? It’s the star of the show, and the ring’s features are meant to complement it. Do you notice how it is securely held in place? It might four to six prongs holding it. Or maybe there are no prongs. If so, you might have a bezel set, which encloses the diamond’s edges with metal. which has no prongs. Some gemstones are tension-set by pressure. 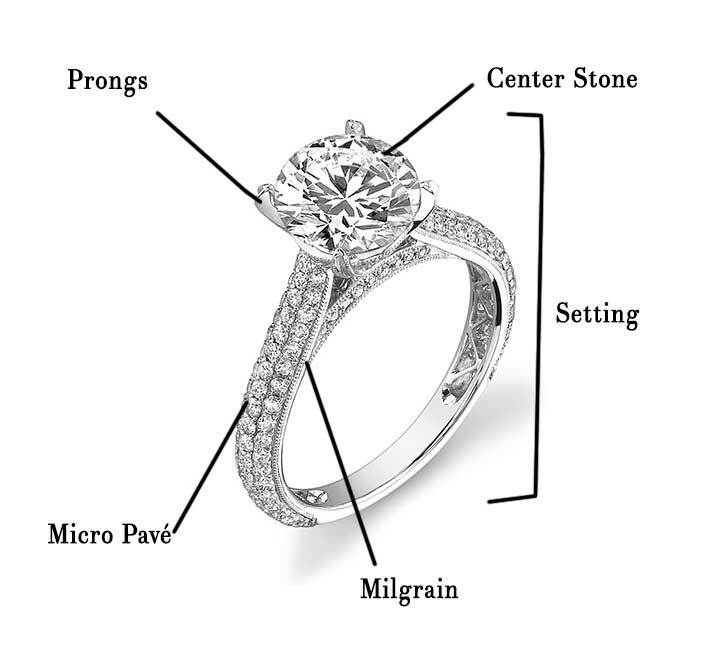 When you hear people referring to the head of the ring, they are talking about the center stone with its prong, bezel, or tension setting. 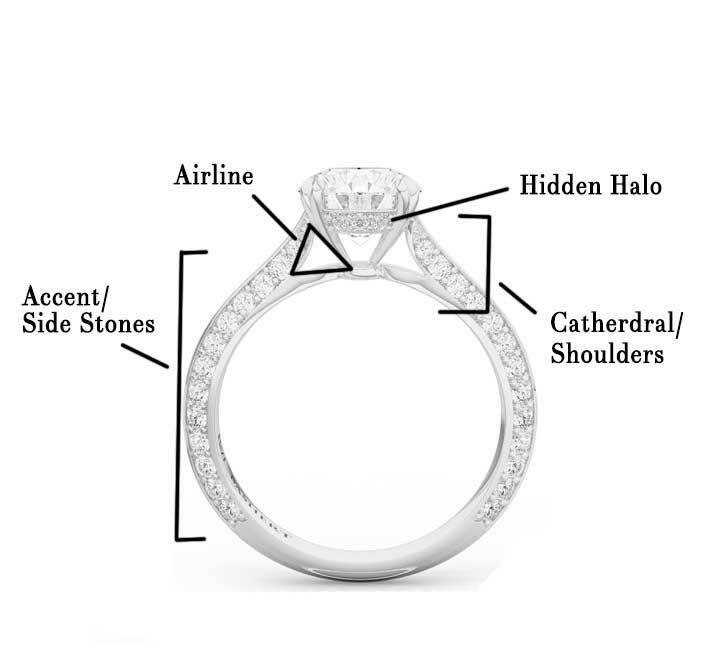 Every other feature of the ring except the center stone is part of the setting, and if you look right beyond its rim, you might see one or perhaps two rows of smaller round diamonds encircling it. 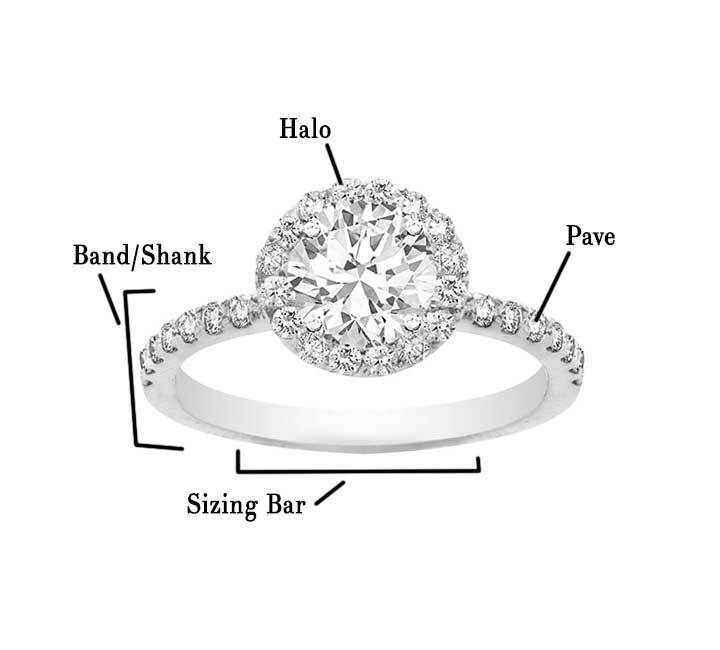 This popular setting is a halo, and it amplifies the natural beauty of the diamond to look larger. Now, let’s hold the ring so you can see its side profile and some other aspects of the setting. At the base of where the center diamond sits, you can find all sorts of design features can be found here in the gallery. You might see accent stones, which are used as side decorations to complement the center stone. Some rings have a hidden halo in the gallery that you can see only from the ring’s profile. Now, let’s pick up the ring by its sides and hold it up. The part of the ring you’re holding that goes around your finger is called the shank or the band. The shank can include all sorts of gorgeous design elements such as gentle swirls called filigree, small beadwork called milgrain, or it can be a solid, sleek precious band. The shank is the part of the ring where you will find accent or side stones that line the band. You’ll find these in a setting of single row, prong-set diamonds called pave or encrusting the band in multiple rows of prong set stones, called micropave. If the band has a channel setting, you’ll find the accent pieces have been placed in a channel between two lengths of precious metal. But sometimes one shank just is not enough! Your ring can have two shanks, called a split shank, or the band can be braided or twisted, or interwoven for a different effect. The shank is where you’ll find the shoulders of your ring on both sides close to the head. If the shoulders slope up to the edge of the center diamond, you have a cathedral setting, which adds elegance and drama as it meets the prong setting midway. This feature is an opportunity for extra details for “wow” factor. You’ll also might see an airline, which is an opening in the shank under the head visible from the side view. Just like the rest of the shank or the gallery of the ring, your cathedral also can contain pave or micropave accents. One important stop to wrap up our tour is the sizing bar. See the very bottom of the ring at the center of the shank? This area can be made of plain metal that is reserved for re-sizing. Having diamonds or a design all the way around the ring can be tricky for re-sizing, so reserving this part of the ring without any special design is especially helpful. Not only does it make re-sizing much easier, but you can do so without losing any of the look of the ring. Your jeweler will use this area to cut and adjust the ring for a perfect fit. 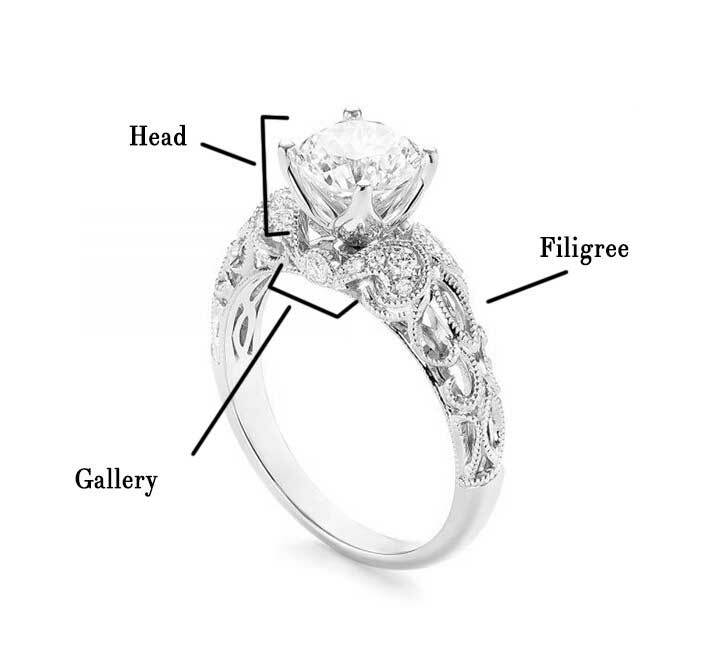 We’ve reached the end of our behind the scenes tour of the essentials of an engagement ring. As you can, an engagement ring is a beautiful and seamless piece of jewelry that contains much more than meets the eye. We hope you will feel more confident knowing more about the behind the scenes story about your current ring or one that is in your future. We also hope we have sparked your interest in learning even more about the part of a ring! Want to learn more? Have other questions that you’d like to ask so you can custom design your own ring? Let us share our passion for fine jewelry with you. Please call or visit us at Inter-Continental Jewelers to get the answers to all your questions. We love our customers and love helping you feel confident in finding exactly what you want.